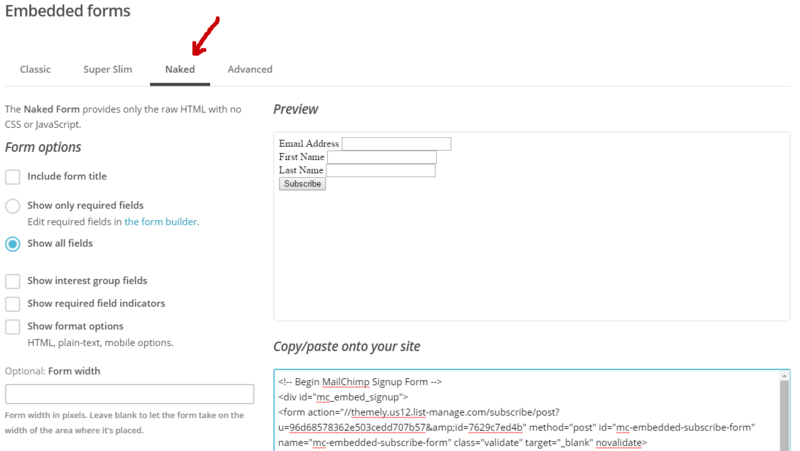 You can enter any form code here but styling is supported for Mailchimp and ConstantContact. You can override form styling in Integral Options > Custom Code > Custom CSS. In order to display just the email field you will have to modify your form code when you grab the embed code from Mailchimp or ConstantContact. Highlighted in RED is what we removed, in GREEN what we added. When getting the code from Mailchimp or ConstantContact to embed the form into your website, make sure to select the NAKED FORM option. This is basically a form with no styling.